Working on the Ancient Lands is always also a great process of learning for me. Even though it took me six years to get to this point, during which comperatively little content has been created, it doesn’t feel like wasted time as I don’t think I had anywhere close to the skill needed to make the world that I am refining now. But I still spot mistakes that were made and that hold considerable room for improvement. While originality is overrated, I made some decisions early on about what fantasy stereotyps I don’t want in my setting because they are already everywhere (at least in the fantasy I was reading and playing back then): No Dark Lord, no demonic invasion, no lost golden age, no diminishing magic, and no default good PCs who kill default evil antagonists for no other reason than charity or to safe the world/kingdom. And I still really like those and mostly stick to them. Instead I came up with the idea that PCs are clan warriors who protect their village by fighting of monsters. But what first was a solution, and not a very well thought out one, gradually morphed in my head into a mandatory requirement. Not only do I now regard it as a dead end, it also made my pretty much completely ignore aspects of the setting that are actually pretty important. A major one of these is social conflicts and the main factions involved in it. One thing I like so much about the Knights of the Old Republic series is their web of factions. In the Star Wars movies the Jedi and Sith are both actually really bland, but in KotOR they are more multi-faceted and you also get the Mandalorians as a third faction. And you don’t have that tunnel vision on the Skywalkers, which makes it all a lot more interesting. I know I want some of that. Other great examples of factions are the Dragon Age and Mass Effect games, which really have them in the center of worldbuilding rather than the main stories, which serve more as framing devices to see the factions clashing. I think that great conflicts are those that arise from specific circumstances unique to the world. Like the dark side of the Force in Star Wars, demonic possession in Dragon Age, or Defiling in Dark Sun. This results in conflicts that couldn’t take place in any other world as well and creates a real reason to play in this specific world rather than any of the dozens that are already around. If you want people to get invested in your setting, it needs to offer something that existing settings don’t. Again, you don’t need to be original in every element of the setting (which probably wouldn’t even work) but at the very least have one new thing, or new combination of existing things. 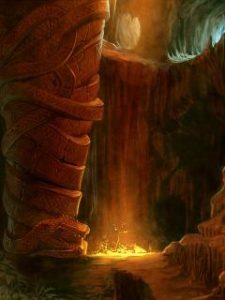 In the Ancient Lands, this original element is a natural world that is too powerful to be subjugated and makes large scale civilization impossible. Civilizations always stay small and are short lived, as agriculture is only sustainable with the blessing of the gods of the land. As there a few spirits that have both the power and inclination to create such havens where crops and herds are relatively safe from wild animals and the the severe elements, settlements always remain fractured and populations are unable to expand. How people are dealing with this situation is the basis for my current approach to the four main factions. Previously I had treated the factions as relatively small organizations, but I think the following ideas probably work best when almost all settlements can be associated with one of these factions, even if they have no unified hierarchies. Druids are the mainstream group of shamans who serve as intermediaries between farming villages and the spirits of the land on which they live and work. (No longer the sorcerer hunters I treated them as previously.) In druid philosophy the current state of the world is the natural way of things and trying to fight nature can lead to no good and will always lead to premature destruction. Instead, the only way to find a life of peace and relative safety is to learn and understand the laws that govern nature and use them to your advantage instead of trying to work against them. In this regard druids are deeply conservative. This life is close to as good as it gets and any troubles are either the result of trying to defy nature or inevitable facts of the ways of the world. Accepting the limits of what mortal peoples can achive in a world in which they are not the masters and focusing on avoiding unnecessary clashes with the wilds and their spirits is the only way to a content life. The Sakaya are a cult that accepts the dominance of natur and the greater power of spirits and gods, but rejects them as masters over their lives. Sakaya do not worship the spirits and turn for them for guidance and protection and instead draw their strength from relying on the cooperation with other people. Nominally they are a unified society of equals, though in recent decades the warrior companies on the coasts have increasingly reduced ties to the monasteries in the mountains. Sakaya will make bargains with spirits and occasionally agree to paying regular tribute, but they offer no devotions to them. Their strength comes from winthin themselves and their mutual cooperation to overcome the hardships of life. Striving for excelence in one’s skills and sharing resources for the greater good is the best way to support the community and create a peaceful life for oneself. Wilders are generally small and remote settlements that share the belief with the druids that mortal efforts can not overcome the indomitable forces of the natural world. But they refuse to remain content with lives of hardship and permanent struggle and instead seek solace in an even greater power. Wilder cults worship the primordial gods of the earth and the sea that still rule these vast realms below the surface world as they have done since the beginning of time. Druids regard this as a worship of demons and the calling of powers into the world whose corrupting influence can only lead to disaster and suffering. In the eyes of most people, wilders are little different from sorcerers in the threat they pose to the rest of the world. Sorcerers are witches who deny that the laws of the natural and spiritual world are unshakeable and refuse to accept that mortals can never be more than they are. They have turned to sorcery as a source of magic that is not bound to the natural laws and has the powers of primordial chaos to reshape reality itself. Sorcerers regard wilders as superstitious cults that have no understanding of the powers that they worship. The primordial gods of the deeps are simply spirits whose powers are open to mortals just as well. Sorcerers are very rare, perhaps numbering only a few hundreds in the whole world. But their attempts to reshape the world around them to their whims makes them an extremely dangerous threat in the eyes of all the other groups. Even sorcerers who seem like kind people and mean no harm to anyone warp and corrupt the world around them and leave behind areas of toxic blight in their wakes. They are all seen as madmen who risk dooming the world forever. None of the groups are outright good or evil. Sorcerers are always destructive and wilders regularly play with very dangerous forces, but this does not mean that players can simply kill all of them and be done with it. Wilders often live in whole villages and while they may be particularly odd people they do not always directly threaten anyone else. Druids seem predestined to be good guys, but of all the groups they are the least flexible and tollerant. In their eyes the other groups are only making things worse for everyone and the Sakaya are foolishly risking their own survival at best. The monastic Sakaya are probably the ones least interested in confronting others but can be particularly stubborn against cooperating with demands that have them submit to spirits. The warrior Sakaya on the other hand are clear troublemakers, constantly looking for opportunities to improve and display their martial skills. This puts them in conflict with pretty much everyone, regardless of ideology. A sixth major group would be the naga sorcerers, who are very much like mortal sorcerers but regard all of those as inferior ursupers of their races ancient powers. Naga sorcerers never cooperate with mortal sorcerers and only tolerate them as personal thralls who are deliberately kept at a weaker power. Previous Previous post: Pointcrawling a Dungeons and Swamp? Next Next post: Pointcrawling in a Dungeon!